I have been working less at night lately. This has opened the door for Robert and I to have something we don't get much of....alone time. As much as I love to get dressed and go out, I can appreciate just the same having an awesome meal at home, in comfy clothes, with just my husband, for 1/4 of the cost. Imagine Robert's surprise when he came out of the room to a candle lit dinner for 2, right in the comfort of his own home. I didn't tell him about it, I just did it. He would have been happy with a grilled cheese sandwich, (thank you Lord for a simple man) but he was so thankful, and grateful for the extra effort I put in. We enjoyed the meal, and the time together. He has said this week that he wants to start a website called mywifeisthebomb.com, so I'm thinking I'm doing a pretty good job at this wife thing. 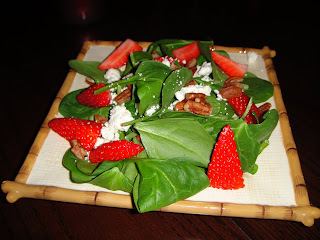 Spinach Salad with goat cheese crumbles, strawberries, candied pecans, and poppy seed dressing. 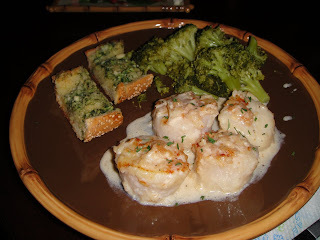 Sea Scallops in Vermouth Sauce, steamed broccoli, and dill weed garlic bread. Table for 2. (Yes, I moved the laundry basket). yummmy!! i love date nights in! although i have never ever cooked like you did ! wowzers!!! you are a great wife!!! Those are some of my favorite date nights. I'll either make a nice meal or we'll get nice take out, light candles and we'll even eat in the dining room. Sure, going out is fun too, but you could have just as nice if not better time at home. Obviously you knew my first question would be about the laundry!!! I must take after Nanny Connie. Glad you are taking advantage of these rare opportunities - Bella's arrival will be here soon enough and with 4 children your place won't be "empty" all that much. I wish I had a husband who would eat like this...but like you said simple is GOOD. 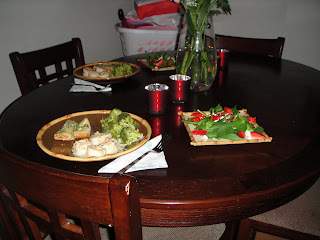 Maybe I should go cook for other people's date nights!! !